PMC goes on tour around the UK | What Hi-Fi? Speaker specialist PMC is touring the UK from September to November, setting up a series of special events at nine of its dealers around the country. 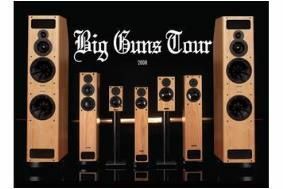 "The Big Guns Tour" is designed as a showcase for the company's i series of speakers, including the unveiling of the new MB2XBDi floorstander. Entry is free, and the eight-county tour is intended "to give visitors a unique chance to experience the entire i series range" and meet the people who make it. Checkout the PMC website for further details.